You'll need a mini-cupcake baking tray and a 2 1/2 inch cookie cutter. Preheat the oven to 350°F. Stretch out the crusts and cut out 30-40 circles with the cookie cutter. Cook them in batches in the mini-cupcake tray for about 12-15 minutes. Once ready, remove from the mold and move on to the next batch. Let cool to room temperature. 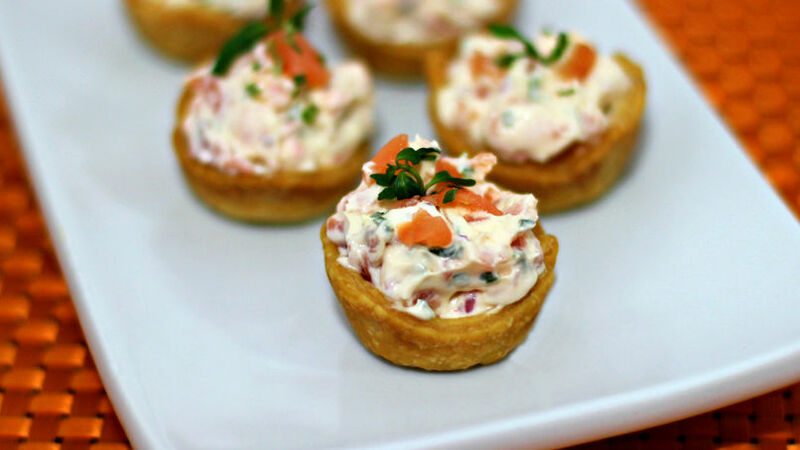 Cut the smoked salmon into small chunks, and then mix with cream cheese and the rest of the ingredients. Fill each basket and decorate with mint leaves. Serve as snack or appetizer. You can use puff pastry instead of piecrust. You can also use shrimp, chicken or crabmeat instead of salmon. Let's celebrate Easter with canapés filled with smoked salmon salad, an easy recipe that looks great when served with mint leaves. Contrary to what you may believe, this recipe isn't expensive because the filling can be made with salmon, shrimp, chicken or even crabmeat.